You can modify variables of algos started by you or others with whom you share an order book with. Top: Running algo variables can also be modified from the Parent Order Book window. 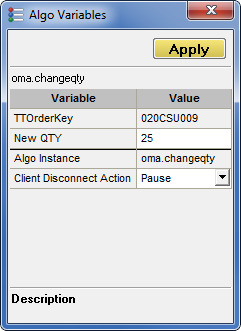 Right-click the desired order and click Modify Algo Parameters from the context menu. The Algo Variables dialog box appears. Click Modify Algo Parameters from the context menu.